In my early thirties I had a girlfriend whom my friends and family used to call Fill. Many people upon first meeting her would ask if her name was really Phil and we would let them in on the acronym her moniker revealed which was “Food Is Lotsa Love”. For four years all of my friends would scramble for invitations to dinner at my house on the weekends in which they could be regaled with dishes from Fill’s repertoire of recipes handed down by the women in her Grecian family. These were things like fried chicken and lemon squares with dilled rice, zucchini stuffed with lamb, lamb spaghetti, potato and egg scrambles and tangy dolmadas. She also had her personal Southern California surfer girl’s roster of specialties that included pulled pork tacos on homemade half chewy and half crisp taco shells, enchiladas in deep green verde sauce and broiled jerk chicken sandwiches that put tropical islands to shame. At the time, I was more of a professional work-a-holic with a high powered career who hardly set foot in the kitchen myself so I was hard pressed to understand an iota of how fueling the body for the day could equate to an emotional experience the likes of what I would see in Fill when she would spend hours prepping delicacies for my entourage and me that would be gulped down in mere minutes. I certainly didn’t want to waste any of my precious hours in the pantry when there were deals to me made and contracts to pursue. When I was a kid I used to wonder why my mom would get so giddy on Thanksgiving and Christmas eves with the idea of waking up each holiday morn at five a.m. to start cooking a meal that would proceed to take the entire day as she slaved over a hot stove. Greyhound cocktails to ease the ride aside, she would steadfastly remain in her apron from the moment the stuffing fumes woke my siblings and I from sleep until the last slice of pumpkin pie mingled with our tryptophan comas near midnight. Although I definitely enjoyed making meals for my daughter while she grew up, I prided myself on the quick and easy no nonsense choices. All of this was par for the course until five years ago when I really turned up my foodie radar a notch. It started with a Christmas dinner I made from scratch in my small Venice Beach bungalow for some visiting Austrian artist friends, my brother and the Cute Gardener when our relationship was nary a month new. 48 hours of cooking started with turkey brining and sourdough bread frying for a sausage sage stuffing and ended with hand-whipped cream for special sweet potato casserole cup desserts. As my friends laughed and imbibed in my tiny living room for two days, I wiled away the hours with John Coltrane Pandora in my miniscule kitchen. 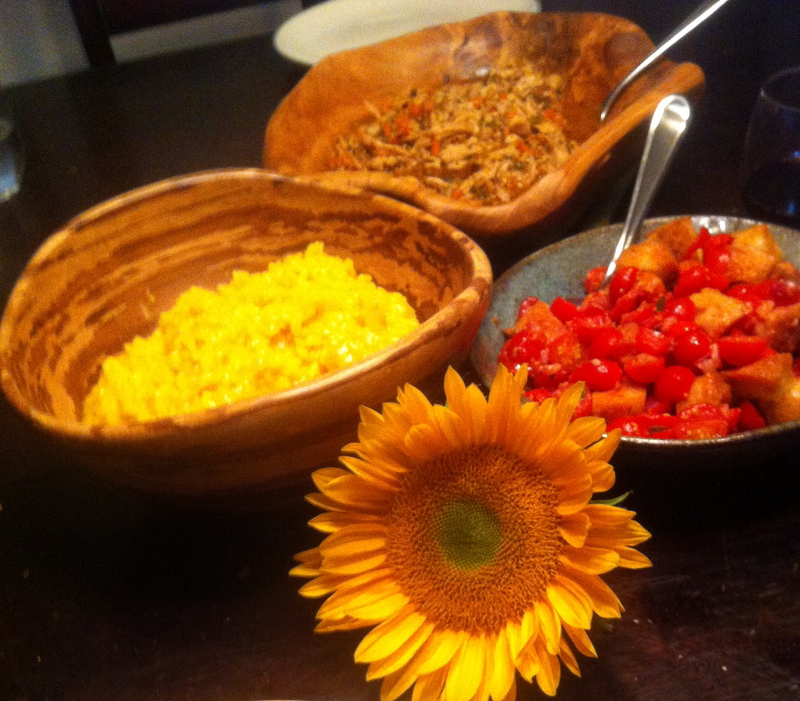 The smiles on my guest’s faces were the cherry on top of the cake of satisfaction I felt after whipping up that meal. I realized while doing so that food really is love and there is an extreme squirt of ecstasy that is released in the brain when you know you are putting effort into making those you are fondest of feel content in the belly—delivering umami to their most primal necessities. 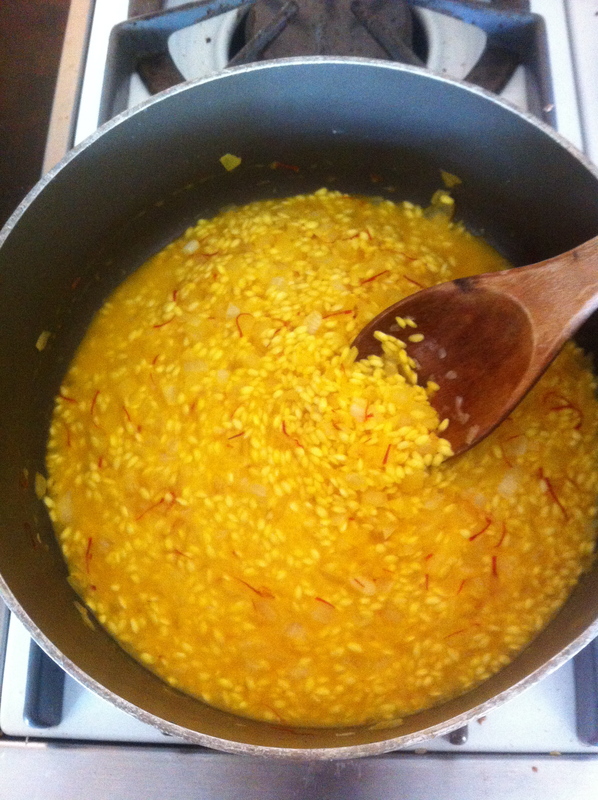 Of late, my love has turned up in various pots of saffron risotto. Risotto is truly one of those foods made with affection. No person in their right mind would stand over a hot pot for up to an hour, stirring constantly, unless they were doing it from the heart. But there is something magical that happens when I start the first burner going for the chicken stock up until the moment I swirl in the accentuating Parmesan cheese at the last minute before serving that can only be described as love—my pain in my right wrist goes away, time disappears, and moments pass swiftly just like they do when I am in the zone painting or writing a short story. My chest swells with delight and I am given the privilege to see the smile alight the lips of the first person who takes a steaming bite. If that isn’t love, I don’t know what is. Bring the stock to a boil, then reduce to a low simmer. Ladle a little stock into a small bowl. Add the saffron threads or powder and leave to infuse. Melt 4 tablespoons of the butter in a large saucepan until foaming. Add the onion and cook gently for about 3 minutes, stirring frequently, until softened. Stir until grains start to swell and burst, then add a few ladlefuls of the stock, with the saffron liquid, and salt and pepper to taste. Stir over low heat until the stock is absorbed. Add the remaining stock, a few ladlefuls at a time, allowing the rice to absorb all of the liquid before adding more, and stirring constantly. After 20-25 minutes, the rice should be al dente and the risotto golden yellow, moist and creamy. Gently stir in about two-thirds of the Parmesan and the rest of the butter. Heat through until the butter has melted, then taste for seasoning. Transfer the risotto to a warmed serving bowl or platter and serve immediately, with the remaining Parmesan sprinkled on top. This entry was posted in Art of Cooking and tagged art of cooking, Cute Gardener, food is love, Kimberly Nichols, saffron risotto, Unorthodox Foodie by unorthodoxfoodie. Bookmark the permalink. Delicious writing – really tasty visual and verbal pictures.